Brand new professional grade painters pyramid work supports brought to you by Hyde. 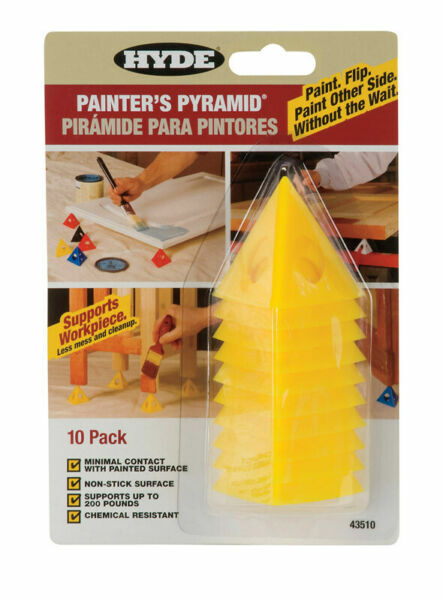 These lightweight pyramids support the object while painting or staining. You can [aint one side and then immediately you can flip the item to paint the other side. It is non-sticky to the surface to keep your surroundings clean. Easy to use. Supports project up to 200 lbs. At Max Warehouse we make shipping easy and understandable. We gladly ship to all 50 states in the USA and process orders as quickly as we can, normally within 1-3 business days. Actual shipping times vary between 1-5 business days. Most often, the total time to receive your order is 2-8 business days. We normally ship using services offered by DHL, Fedex, UPS or USPS. Standard shipping usually takes 3-5 business days. At Max Warehouse, our goal is to make sure customers are completely satisfied with their purchases. We will gladly accept returns goods that are returned in new condition and original packaging, within 30 days from the receiving date. Refunds cover the cost for the product only and do not include shipping charges. The cost of return shipping is not included. We reserve the right to refuse refunds on personal use products for any reason. Please examine the box and all contents for any signs of Defective or Damaged products immediately upon receipt of shipment. If possible, please inspect for damage at the time of delivery, refuse any packages that are damaged, and notify SJS Commercial Customer Care. SJS Commercial will replace any damaged or defective items that do not carry a manufacturer&apos;s warranty. Replacements and exchanges for items under warranty must be provided by the manufacturer. If you require assistance in utilizing the manufacturer?s warranty, please reach out SJS Commercial Customer Care, as we are happy to assist you in this process. You may be able to cancel your order within 1 hour after it was placed. After that time, an order will not be canceled once it has been submitted. Your order will be shipped and the tracking information will be uploaded 24-48 hours after it was placed.